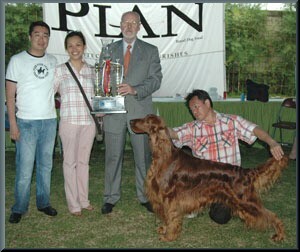 *Best In Group Camperdown & District Kennel Club Inc........and his Australian Title in his 4 shows !!! *winning 4 BIS,14 groups,6 reserve groups & helping a number of Junior Handlers to wins. Vice Pres.of FCI Mr. Karl Raissinger (Austria). 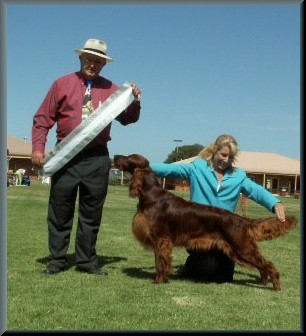 "Grd Ch Eireannmada Lets Party"
Winning the Pal Pedigree Australian Show Dog of the Year Gundog winner for WA. This is the second time Guinness has achieved this win. Congratulations to Bettina and Grant Morris !